CAP CANA, Dominican Republic — David Ortiz is here for a few days to celebrate the success of his charitable foundation and raise some more money to help sick children in two countries. A handful of reporters from Boston are here to ask David about his free agency, Bobby Valentine and all other hot topics. But there was one comment I heard today that impressed me the most and it had nothing to do with baseball. Susan Rickman, president of the World Pediatric Project, said the David Ortiz Children's Fund has provided 60 kids with open heart surgery in the Dominican Republic whose families could otherwise not afford it. The fund also has paid to train 450 nurses. "It's inspiring," she said. "That transcends his celebrity." Dr. Peter L. Slavin, President of Massachusetts General Hospital, said that Ortiz's unrestricted contributions have helped the hospital make upgrades to care and services it may not have been unable to afford otherwise. Slavin said Ortiz visits MGH often, hosts sick kids at Fenway Park and even hands out teddy bears on occasion. The veteran hitter was pleased to meet with his new manager at a charity event in his home nation of the Dominican Republic tonight. "The man has a big heart," said Slavin, who joked that he's crossing all his fingers and toes for Ortiz to return to the Red Sox. Ortiz has JetBlue, Reebok, Vitamin Water, Coca-Cola, Dunkin’ Donuts, and Pop Chips among his sponsors. It sounds like their money is going in a good direction. Ortiz is seeking long-term security, pointing to the deals that Adam Dunn received from the White Sox (four years, $56 million) and Victor Martinez from the Indians (four years, $50 million) last season. Dunn was 31 when he signed that contract and Martinez 32. Ortiz turned 36 last month. But Ortiz also hit .308 last season with a .953 OPS. “Do I have to explain what I’m capable of doing? Everybody already knows. I’m not even going to go there,” Ortiz said. “We just need to get into an agreement and when that happens, it’s game on. That’s not entirely true. The Sox offered Ortiz salary arbitration on Nov. 23 and he has until Wednesday to decide whether to accept. 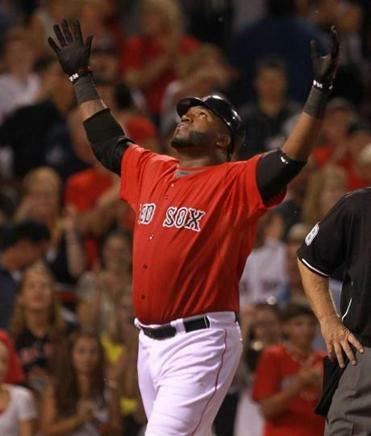 By accepting, Ortiz would be guaranteed a contract for 2012 at a raise from the $12.5 million he made last season. He will meet with his agent, Fern Cuza, in New York on Monday to discuss the merits of that idea. “We’re thinking about what we’re going to do. We don’t know yet,” Ortiz said. Cuza also plans to sit down with Red Sox general manager Ben Cherington at baseball’s winter meetings in Dallas next week. Cherington has said since the end of the season that retaining Ortiz was a priority and on Thursday called him a “remarkable” player.